Safety is a top priority when you are planning a scaffolding rental. In order to make sure that your scaffold is safely and properly installed and maintained, you may want to schedule consulting services from Scaffold Resource. Our consultants will work closely with your general contractor to make sure that your scaffolds are placed and used properly during every step of your project. By relying on our consultants, you can rest assured that your scaffold installation is in compliance with OSHA regulations. We can also identify and prevent potential problems that may arise in your scaffold erection. For more information about our quality consulting services , be sure to contact Scaffold Resource near Washington, D.C. by calling (301) 924-7223. Whether you need a scaffold canopy for a sidewalk, or are planning a comprehensive shoring system for a building, we will be there to assist you. Our company looks forward to assisting you with your upcoming project. Before any workers are allowed to use a scaffolding installation , the system must be inspected. This video will provide you with an in-depth look at some essential scaffolding rental safety tips. An inspector will look for properly installed base plates, as well as any signs of movement in the screw jacks. Finally, the stability and strength of the bracing connections will be examined. If you are in need of quality scaffold rental serving Washington, D.C., look no further than Scaffold Resource. From quality construction scaffold installations to secure shoring systems, we can provide you with a complete range of services. Call us at (301) 924-7223 to set up a scaffold rental for your project today. When a construction worker uses a scaffold, he or she will be elevated high off of the ground. Since a scaffolding rental involves high elevations and other safety considerations, it is important to erect and maintain your scaffold with the utmost care. 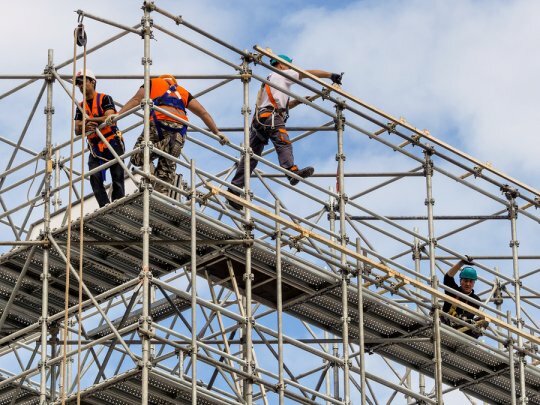 Before you set up scaffolding on your construction site, you will want to read up on OSHA’s safety regulations regarding the proper set up and use of scaffold systems . Let’s review some important safety tips to keep in mind when you are using a scaffold. In order to make sure that all of your workers are safe when they are using a scaffold, you will want to provide comprehensive training to all of your employees. Before a worker is allowed on a scaffold, he or she should learn about how to safely use the scaffold frame and work at a higher elevation. Your training will also need to cover fall prevention tactics. As you are setting up your scaffold rental, you will want to learn all about the proper load capacity for your particular set up. If the listed load capacity is exceeded, you may place your workers in danger of experiencing a fall. It is of the utmost importance that you make sure that your scaffold is properly secured before any workers are allowed to use the system. To prevent an unstable work surface, the scaffold needs to be securely attached to the building. You may also want to talk to your scaffold rental company about including a locking system in your installation. For more scaffold safety tips, contact Scaffold Resource. We offer highly rated scaffolding rental serving Washington, D.C., and we can provide you with the right construction scaffold for your job. To hear more about our quality rentals, give us a call at (301) 924-7223. 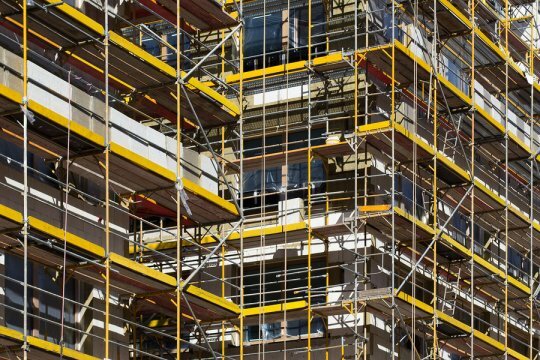 When you are considering a scaffolding rental for your construction site, you may want to ask a technician whether a scaffold or shoring system will be the appropriate choice for your project. While a scaffolding rental can be used by construction workers to reach higher elevations, shoring is designed to support structures that may be unstable during a renovation or construction. To help you decide on the right rental system, here is an overview of how shoring differs from scaffolding. Shoring and scaffolding differ primarily in their functions on a jobsite. When you erect scaffolding around a construction site, your workers will rely on the scaffold to reach high up or out of the way work areas. By contrast, shoring is used as a means of support and stability for a building while it is being constructed or renovated. Shoring can even be used to stabilize a scaffold system. As you are choosing between shoring and scaffolding, you will want to consider the required safety ratings of the two systems. Scaffolding is designed specifically for use by construction workers, and is thereby regulated by strict safety standards. The safety regulations surrounding a shoring installation may not be regulated to the same standards. After you have reviewed the differences between shoring and scaffolding, you will be ready to make your choice. If you are in need of a stable structure that will be utilized by workers in the job, chances are that you are in need of scaffolding. Shoring is an appropriate choice for stabilizing an existing structure. At Scaffold Resource near Washington, D.C. , we can provide you with all of your shoring and scaffolding rental needs. When you need top quality construction scaffold services, do not hesitate to contact our company. For more information about our construction rentals, give us a call at (301) 924-7223.